Courtesy of HUNT BROTHERS REALTY, INC.. 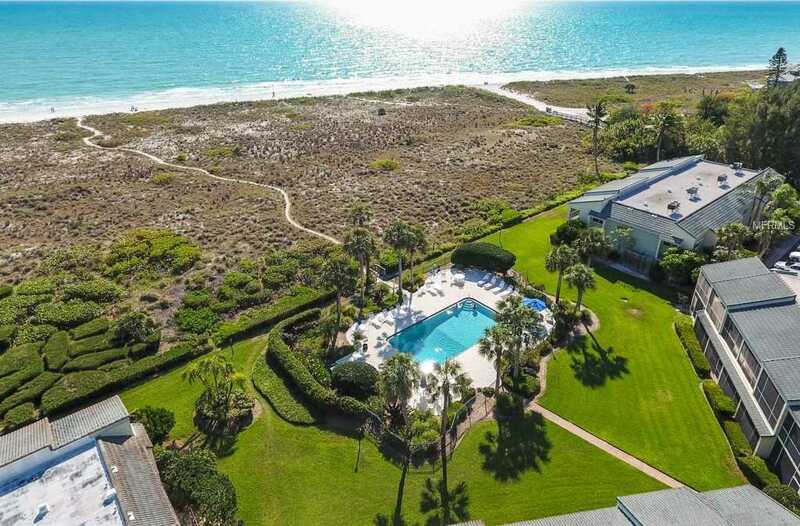 If absolute peace and quiet, with nothing but the sound of waves and seabirds while walking the soft sands of Longboat Key, is your idea of Paradise, you’ve found home. Welcome to Sea Pines, one of the last hidden gems directly on the Caribbean-blue shores of the Gulf of Mexico. This end unit Turnkey Furnished home was completely remodeled and opened up so that you see the pool, palm trees and the beach from the second you walk in! The kitchen is something to write home about, with timeless white and black speckled stone counter-tops, mosaic gray back-splash, stainless steel appliances and white Shaker cabinets. Extended from the kitchen is a large office/work area for your computer, printers or for crafting! The Master Bedroom is en-suite with King sized bed, is large with it’s own sliding doors out to the screened lanai, perfect for morning cups of coffee! The Guest Bedroom has two twin beds, it’s own bathroom with walk in shower and a large walk in closet. The community is very friendly, allows dogs (for owners) and rentals (minimally 1 month, 4 times a year; seasonal 2019 rate was $6000/mo). NEW A/C and Hurricane Shutters! Moments away is the newly re-opened Mar Vista Dockside Restaurant, shopping at Whitney Plaza, Longboat Village (with Peacocks!) and just across the bridge to Anna Maria Island. Need to whoop it up? St. Armands Circle is only 11 miles away and Downtown Sarasota is a few minutes from that! Restrictions: Only owner can have pets (Tenants cannot). Please, send me more information on this property: MLS# A4432792 – $560,000 – 6945 Gulf Of Mexico Dr #11, Longboat Key, FL 34228. I would like to schedule a showing appointment for this property: MLS# A4432792 – $560,000 – 6945 Gulf Of Mexico Dr #11, Longboat Key, FL 34228.